No 80 Whitebeam Road is an unusual building in the middle of suburban housing in south Dublin. It stands off a large roundabout and is difficult to notice behind the trees and shrub. I have often passed it by, and only noticed it in the corner of my eye. But this is Clonskeagh Castle. I am in Dublin for a hospital appointment today, and on my way back from a visit to Saint Vincent’s Hospital I stopped to see Clonskeagh Castle, which stands on a roundabout, known locally as ‘The Circle,’ at the place where Whitebeam Road and Whitethorn Road meet. Clonskeagh Castle is an interesting example of the Irish Georgian castle style. It is said the castle was built around 1798 for Henry Jackson (1750-1817), an industrialist and political activist, perhaps on the site of an earlier castle. Jackson was probably born in Carnaveagh House in Ballybay, Co Monaghan, and in Dublin he became a leading member of the United Irishmen. His daughter Eleanor married one of the leading figures in the 1798 Rising, Oliver Bond (1762-1798) of Lower Bridge Street, Dublin. Oliver Bond died in prison of apoplexy on 6 September 1798, only days after his death sentence had been commuted. In the aftermath of the 1798 Rising, Henry Jackson moved to America with his wife, Elizabeth McGrath, and many of their children and grandchildren, including the widowed Eleanor Bond, and settled in Baltimore, Maryland. Elizabeth Jackson died in Baltimore in 1805; Henry Jackson, who had built Clonskeagh Castle, died in Baltimore on 30 June 1817; Eleanor Bond died there on 15 September 1843. The family later claimed to be related to Andrew Jackson (1767-1845), the seventh President of the US (1829-1837), but there is no proof of this kinship. After the Jackson family left Clonskeagh Castle, two large towers were later added to the castle in 1811. In the mid-19th century, Clonskeagh Castle was the home of George Thompson, who also owned lands in Mayne, Co Meath. His son, George William Thompson, was a solicitor at 9 Hume Street, Dublin, and in the 1870s he owned 521 acres in Co Cork, 819 acres in Co Westmeath and 70 acres in Co Meath. Clonskeagh Castle was used as a jail between 1916 and 1922, when the prisoners there included local people involved in an attack on the ‘Black and Tans’ on Clonskeagh Bridge. G&T Crampton carried out restorations and renovations at the castle in 1953. A decade or two earlier, in 1939-1940, Cramptons had built the houses Whitebeam Road, where the architects were Fuller & Jermyn. In September 1972, the town charter for Tralee, Co Kerry, which had been missing for more than 130 years, mysteriously turned up in Clonskeagh Castle. Tralee was granted borough status by King James I in 1612. The charter also gave Tralee the right to elect two MPs to the Irish House of Commons, and allowed for an annual fair on the feast of Saint James on 25 July, as well as a Saturday market. The charter, written in legal Latin and on vellum, was found in September 1972 by a Dublin-based solicitor who was acting for the then owners of Clonskeagh Castle. The charter was found in an envelope addressed to Alice Rowan from Camp, near Tralee, Co Kerry. She was a daughter of the Ven Arthur Blennerhassett Rowan (1800-1861), Archdeacon of Ardfert (1856-1861), an antiquarian and local historian, and a grand-daughter of William Rowan, Provost of Tralee (1807-1811). William Rowan was the Provost of Tralee who signed the return of Arthur Wellesley as MP for Tralee in 1807. But the future Duke of Wellington never sat for Tralee, choosing instead to represent Newport on the Isle of Wight. Alice Rowan’s aunt, Arabella Rowan, married as his second wife Charles Fairfield and they were the grandparents of Rebecca West (1892-1983), suffragette, novelist, radical socialist and friend of HG Wells. 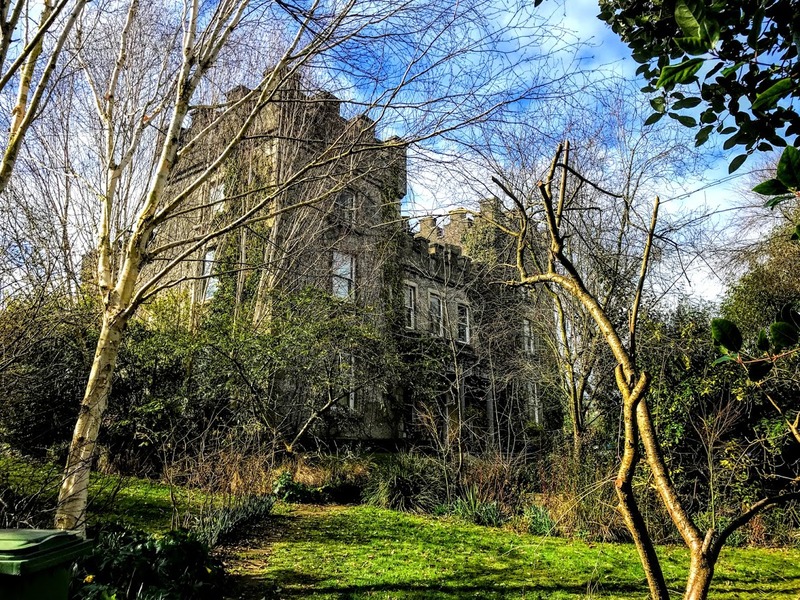 The charter had been missing from Tralee since the borough council was abolished in 1840, and it is still not clear how it ended up in this suburban castle in Dublin. There are two vaulted stone cellars to the left of Clonskeagh Castle which were known locally as ‘The Dungeons.’ In the past, local children could get into these cellars, and many left their initials on the roofs using candles. 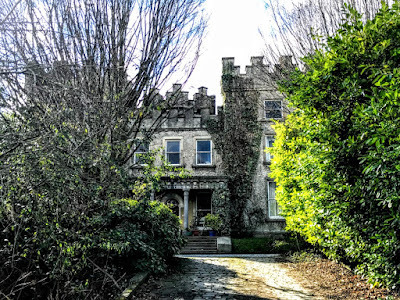 In recent years, Clonskeagh Castle was divided into four apartments and was sold in the late 1990s to a single family that still lives there. The large basement and cellars, which ceased to be used in the early 20th century, became redundant and are now used only for storage. When they bought Clonskeagh Castle in the 1990s, the new owners blocked one of the driveways and planted a large open grassy area in front of the castle with trees and shrubs, so that many people pass by without ever noticing that there is a castle in the middle of these suburban housing streets in south Dublin. Some years ago, Robert Bourke architects were approached by the current owners to advise on cost-effective and sensitive repairs to the structure of Clonskeagh Castle and to consider new uses for the disused basement. The planned works included remedial works to the basement, alterations and repairs to the upper floors and an improved landscaping design. Thank you for this historical look at Clonskeagh Castle! I find it interesting as I coincidentally wrote about one of the former occupants (Wade Thompson) in my recent blog. Many thanks for that piece of research The Digbt estate in Kildare owned the three Aran Islands until 1914 and their land agents were Thomas Thompson and later his son George.